It wasn’t always easy, but together David and I did it! 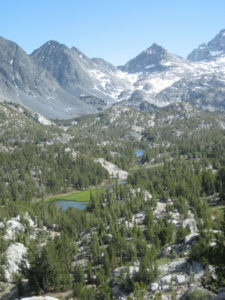 Two and a half years ago, we decided to “semi-retire,” and we moved from my long-time home in rural Washington State, to the even more rural Eastern Sierra town of Bishop, CA. It was hard to part with my good friends – thank goodness for airplanes and telephones! While it’s taken time and effort to grow new friendships, those new friends have grown me too! My faith in God, and my confidence in the HEAL “Relationship Keys”, are strengthened by this life transition. Bishop was David’s home before we married. It’s an exciting place for horse people like David and I. We love exploring the high country and nearby volcanic tableland, where ancient tribes lived and hunted. 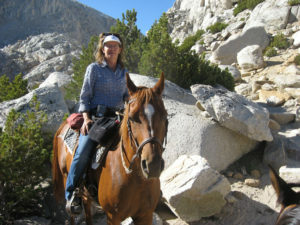 My heart sings each time my mare Dixsi and I ride out on the scenic trail from our small ranch, and now I can easily incorporate trail riding with clients into EFPL sessions. Our equine partners, Beau and Dixsi, recognized their former home immediately when we arrived back here in 2014. They grew up here, and forged strong bonds with David during long rides across this wild terrain. Their years at HEAL, serving in therapy and personal growth programs, have made them ever more personable! Now they help me spread HEAL’s message of connection and heart-centered horsemanship in this “horsey” region. Semi-retired is also semi-employed. *smile* My part-time private practice offers many ways to serve others through office therapy or equine therapy or lessons. I also provide long-distance mentoring, and professional training in the HEAL Model. If you would like to come and learn in person, or set up a mentorship study program by phone or computer, I invite you to call or email me! Licensed Counseling for individuals or couples. Free consultation 1st visit. Professional training in HEAL Model/ Keys to Connection (can include CE hours through NBCC); phone mentoring in EFPL available as well. Equestrian services including coaching, consultation, lessons. Leigh continues to serve as HEAL Director, for the HEAL Keys to Connection™ workshops and the HEAL Facilitator Training Program (HEAL FTP™). Contact Leigh if you are interested in hosting a HEAL workshop.